Lisa Kunkel/Independent Record - Former All-Star big leaguer Chris Capuano throws in a pitch during the second inning of Wednesday night’s game against Missoula at Kindrick Legion Field. Capuano, joining the Brewers for three games, pitched two innings allowing only one hit and retiring the last six batters in a row. Chris Capuano has pitched in the big leagues in front of 50,000-plus fans, facing some of the toughest lineups in baseball and dueling some of the best pitchers in the game. In 2006, he was selected to the Major League All-Star Game. So appearing in front of about 800 people in a Pioneer League Class A ballgame at Kindrick Legion Field Wednesday certainly couldn't have phased the former Milwaukee Brewer hurler? Right? "I was nervous before the game, I got butterflies in the hotel this morning," said Capuano, who is working his way back to The Show after undergoing Tommy John elbow surgery in May of 2008. Capuano started on the bump for the Brewers against the visiting Missoula Osprey, and after giving up a leadoff double to David Nick, the Massachusetts native retired the next six batters in a row, before being lifted from the contest. The Brewers went on to a comeback win over Missoula in a pitching duel, 2-1, on a dramatic ninth inning two-run double by catcher Cameron Garfield. Behind 1-0 in their last at-bat, with Michael Marseco and Joey Paciorek on first and second, Garfield drilled a two-out, two-strike line drive to right field, plating both runners for the victory. Robert Currie earned the win, while Adam Worthington was tabbed with the defeat. Missoula starter Michael Belfiore went six scoreless innings, allowing one hit and striking out eight. The Osprey outhit the hosts 9-3, led by David Nick (3-for-5, two doubles), Paul Goldschmidt (2-4) and Keon Broxton (1-4, RBI). Assigned a restricted pitch-count, the lefthanded Capuano punctuated his introduction to Montana's Capital City by striking out Bobby Borchering to end the second inning. "I had a lot of fun tonight," the personable 6-foot-2, 215-pound Capuano said afterwards. "It felt good to get out there and compete again, to be in a real game with your teammates, and I'm always happy when I put up zeroes. And I didn't feel any pain, which is the most important thing." 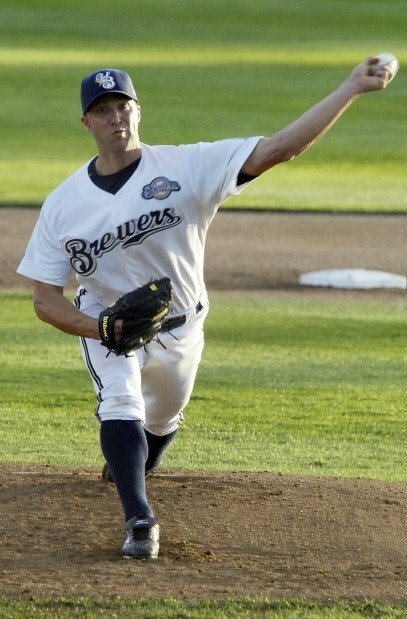 Capuano - a high school Valedictorian and Duke University graduate - made the bigs with the Arizona Diamondbacks in 2003, prior to becoming a mainstay of the Milwaukee Brewers pitching staff from 2005-07. His 18 victories in 2005 was the most wins by a Brewer hurler since 1987. After winning his first five games the next year, he was chosen to the National League All-Star team. 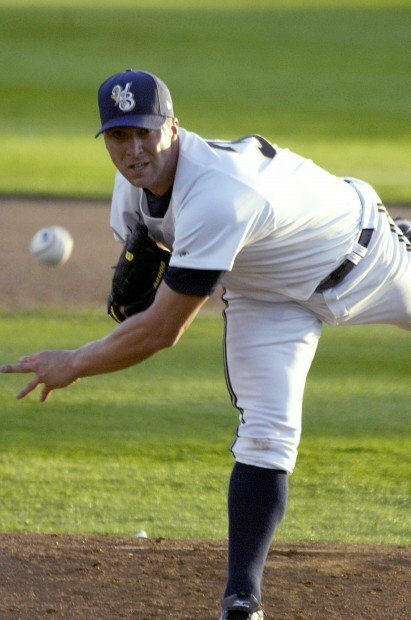 Capuano injured his elbow in 2007, and has not pitched in a major league game in two years. He returned to the mound earlier this summer for the Brewers' Class A team in Arizona, working three innings, before his start versus the Osprey. His rehab program consists of two more scheduled appearances for Helena. "I first noticed (the nostalgia) when I was in the stands here Tuesday night," said Capuano, describing a flashback to his early days of pro baseball. "The kids out on the field running races, the fans rolling the dice. Those types of promotions get phased out when you get to the majors. It really brought back a lot of fond memories of a much simpler time of my playing career." He said his two biggest highlights in the Majors occurred when he stepped on the field of the All-Star game, representing the National League; and when he pitched a victory for the Diamondbacks on the anniversary of 9/11 in 2003. "I replaced Curt Schilling, who was scheduled to start. My dad flew out from Massachussetts, and there was a very moving ceremony before the game. I pitched a great game, it's definitely one of my prouder accomplishments," the 31-year old southpaw said. Capuano is not reserved about his New England roots. He readily admitted to being a "closet Red Sox fan," confessing that he "roots for the Red Sox when we're not playing them." Capuano said that he was excited to be in Montana, and is anxious to spend some time in the outdoors here with his wife, Sarah Clifford. Clifford, a former pentathlete, is currently involved in competitive horse jumping. "When I first started out, I was assigned to the Diamondbacks (farm team) in Missoula, but I skipped Class A, so I didn't make it here," he said. "I am not disappointed with Montana's scenery, the landscape is beautiful. My wife is coming up from Arizona next week, and we're going to get out do some some hiking." Helena improves to 8-19 for the second half, with Missoula slipping to 14-15. The Brewers are five games behind the second-place Osprey in the Northern Division standings. DIAMOND NOTES: According to the Brewers' director of broadcasting and media relations, Steve Wendt, second baseman Cutter Dykstra is in good condition after cracking his nose in Tuesday's game during the ceremonial first pitch by Walker Texas Ranger star Clarence Gilliard, Jr.